The Samsung Unpacked event is held every year and they have created a expectations for revealing their next flag ship device. 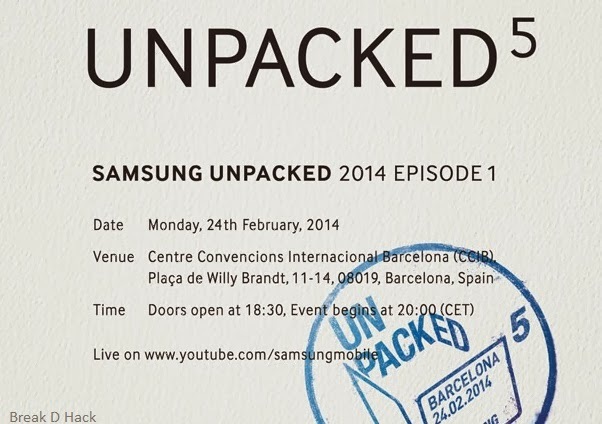 The Samsung Galaxy S5 is set to be unpacked if you can connect what is is been show in the image above. The company has also mentioned the official Youtube link so that we can take it as the illustration that the event will be live streamed. The event is going to be held in Barcelona, Spain, on Feb. 24. This is the same location where the Mobile World Congress(MWC)2014 is set to take place, it is clear that many of the journalists will be in town for MWC so Samsung is trying to grab most out of the opportunity. Many from the tech world think that may be Samsung Galaxy S5 may not be much of an revolutionary update after all and that is why Samsung has not made a individual Unpacked event rather than combining with MWC. Samsung Galaxy S3 and S4 were revealed in a individual Unpacked event, may this be any sort of a game by Samsung. I am pretty sure that the Samsung Galaxy S5 is going to featured in the event and i would bet it has a slightly biggest screen size than the Samsung Galaxy S4 and a back panel like the Samsung Galaxy Note 3 and ram of 2-3 GB and it will be running android 4.4.2 out of the box with the latest version of TouchWiz and i certainly hope that there wont be any finger print scanner since it has been adopted by Apple i bet Samsung will not go in that direction for this time, there is possibility of a retina scanner as there are many rumor, Samsung has not mastered the smart play/pause feature in TouchWiz so there is no way they can pull this off. I hope there is a new iteration of the Galaxy Gear Watches lying around, hope all these will be right but for that we will have to wait till Feb 24 2014.